The LDBSA Rules belong to the members of the LDBSA - you. If you would like to suggest any changes to these rules, please ensure your proposed change reaches the LDBSA Committee no later than one month before any 'Rules' meeting - the sooner the better! The proposed rule should then be voted on, by the team representatives present, at the next LDBSA Rules Meeting. Captains; this is a reminder to pay the second half season match levy by 31st May. £70 = 10 weeks at £7. Payment can be by cheque, or internet banking. Dave Row - LDBSA Treasurer. This year each player in a team will have their own handicap. This will make it a little 'trickier' initialising the scoreboard before a frame, but hopefully, more rewarding for all players. The handicaps are displayed on the LDBSA website under "Registered Players", and should be printed and made available to captains. If anybody would like to query any of the handicaps; please contact secretary@ldbsa.co.uk before 21st December 2018. If there are no challenges or queries by this date it will be assumed that everybody is happy with the handicaps as they stand. Thank you - LDBSA Committee. Captains, please note that due to unforeseen circumstances, the scorecards should not be posted to the address on the back of the card, but either handed to the Match Secretary in person or posted to the Treasurer. If possible enter the details on the website, and send an image of the card to the Match Secretary. Rule 13 has been relaxed, so that no points will be deducted for scorecards arriving late. Please note that the bonus points for winning are not being awarded due to the number of home and away matches being different this season. 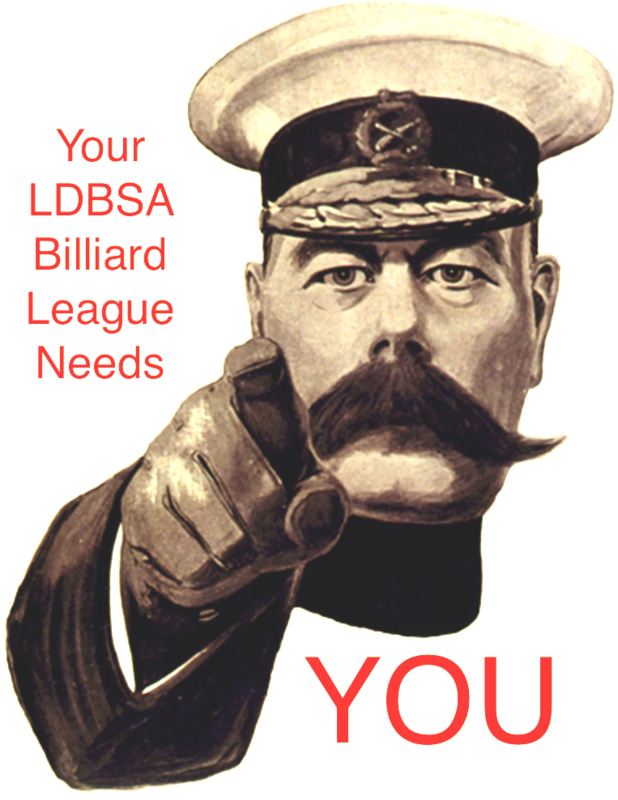 Join your LDBSA Billiard League. Snooker players of Leamington District. Do not let the old enemy Apathy destroy your LDBSA Billiard League. Fight back enlist today. (a) Being no part of any stroke in progress, it shall be replaced and any points previously scored shall count. (c) If a ball balances momentarily on the edge of a pocket and then falls in; it shall count as in the pocket and not be replaced. Matches may be postponed only in very exceptional circumstances and with the approval of the Management Committee. If a team wishes to postpone a match due to a lack of players, they must contact the Match Secretary at least 48 hours before the match is due to take place. Only one match per season can be postponed without penalty, and subsequent postponements will incur a two point deduction.